Barbecues are my favorite part of the summer, but sometimes these get-togethers make it too easy to overindulge. Barbecues are my favorite part of the summer; who can resist good friends, good times, and good food? But sometimes these get-togethers make it too easy to overindulge. Although one day of splurging won't do too much damage, regularly letting loose at BBQs certainly doesn't help with my weight maintenance. I didn't want to wake up Tuesday morning feeling guilty about my diet, so this Memorial Day I made mostly healthy choices. Here's my Feel Great Weight barbecue strategy. I eased into the celebration by enjoying a high-quality bottled beer. I used to drink the light variety from the party keg, but I soon realized that it's difficult for me to keep track of how many trips I've taken to refill my cup—meaning I never knew just how many calories I was sipping. Savoring a flavorful 12-ounce bottle is satisfying and instant portion control for me. And I don't have to worry about the lack of quality beer options at barbecues because I often bring my favorite bottled variety to share with the other guests. My host always appreciates having additional beverage options! I never want to be the girl who shows up with her own veggie burger and whole-wheat bun, so instead, I offer to bring something that everyone can enjoy. My favorite healthy dishes are homemade hummus with pita chips, fruit salad, or a veggie platter with a low-calorie dip. Not only do I get credit for being a conscientious guest, but I also give myself some healthy snacking options. Last weekend, I offered to bring vegetable kebabs to the barbecue. 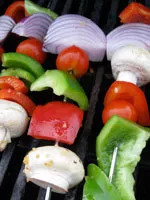 I assembled the skewers with peppers, onions, mushrooms, and cherry tomatoes, brushed them with olive oil, grilled them for just a few minutes, and served them alongside the hamburgers, hot dogs, and other fare. The kebabs were a hit and everyone seemed to appreciate the nutritious side dish. I paired mine with a small hamburger patty, which I ate open-faced with mustard, salsa, and pickles. The combination of filling veggies and lean protein left me super-satisfied, so I wasn't tempted to go back for seconds. And the best part? I never felt like I was depriving myself. When I finished eating, I got up and played a few yard games with friends and family. Stepping away from the food prevented me from mindlessly munching when I wasn't hungry, and a few games of Polish horseshoes and bocce ball helped me burn some extra calories and gave me a fun way to interact with those at the barbecue. How do you keep BBQs healthy? Do you have any favorite dishes you like to bring? Tell us below.